For many people in Mumbai, it is difficult to find any privacy in public space—or even in private space, for that matter. As a reaction to this, artist Tobias Megerle and Studio X, with help from the Chaos Theater and Wondergrass, erected a bamboo structure at the Lab’s Mahim Beach site from January 10–13 in order to create a space for people to be alone with themselves—and to express their own thoughts on the public/private relationships they experience within the city. Visitors to the Lab at Mahim Beach could climb inside the installation and respond to questions posed on a laptop. The answers given by the person inside the structure were then transmitted to another monitor outside, accessible for viewing by all who walked by. By its shear existence, the structure was intended to call into question the boundaries between public and private space. Megerle and Studio X chose bamboo as the structure’s primary material because, as Megerle puts it, bamboo “transcends the normal by placing itself in between the seemingly disparate systems of the city. It appears as quickly as it disappears. It mediates the public and private and adapts to create spaces of intersection within the environment.” Bamboo is also widely accessible in Mumbai, available within walking distance of the structure’s Mahim Beach site. 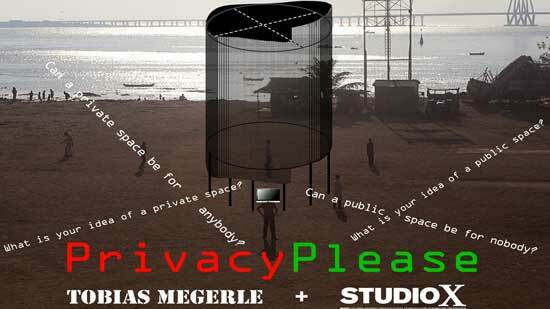 Through this installation, Megerle and Studio X posed crucial questions about privacy in Mumbai: What is private space? What is public space? What is the intersection or dialogue generated between public and private? Can a private space be for anybody? Can a public space be for nobody? Lab visitors who encountered “Privacy, Please” were presented with a chance to respond to these questions and, at the same time, engage with each other.